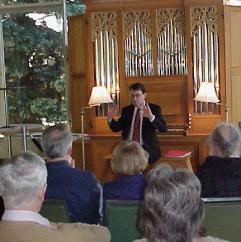 David Wagner regales the group with information about the Karl Wilhelm organ and associated technical topics. 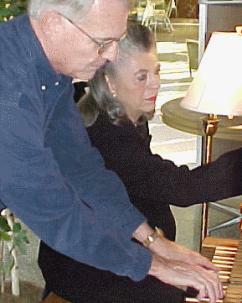 Henry Aldridge explores the touch of the Karl Wilhelm instrument as MaryAnn Balduf prepares her demonstration selections. 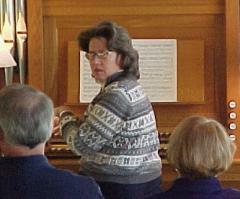 Joann Rickards Clark (JoVo) answers a question about her demonstration selection. 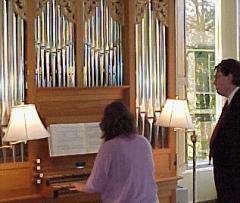 New member Susan Knighton performs Pachelbel as Dave Wagner stands ready to turn pages. Present were Henry Aldridge, Carl Balduf, MaryAnn Balduf, Fred Fahrner, Joann Rickards Clark, Diane Hiltner, Susan Knighton, Patrick Paddock, David Wagner and James Wilkes. Acting President Carl Balduf asked for approval of the minutes as printed on the Michigan Chapter Web site and provided as printed copies at the meeting. A motion to approve was made and seconded and the motion carried. Dave Wagner said that the Madonna University library would be pleased to be the archive for Michigan Chapter OHS material. The sense of the group was that this is a good idea that should be pursued. Suggestions were made about future meeting venues, including the Fox and Redford Theaters, the Michigan Theater in Ann Arbor, the Detroit Institute of Art and the Detroit Masonic Temple. These were felt worth pursuing and several said they would follow up. With a hearty round of applause, the group expressed its gratitude to Dr. Wagner for his hospitality and the wealth of knowledge he imparted about the Wilhelm organ and scale temperament. Balduf then introduced two new student members: Susan Knighton and Patrick Paddock, both of whom are students of Dr. Wagner. In the absence of Treasurer Terry Jankowski, who was in rehearsal for a Messiah performance, Balduf read the treasurer report (printed below). The meeting was adjourned at 11:30 a.m. and a number of participants remained for brunch at the Student Center cafeteria. The previous checking account balance was $1,42713. Deposits were made of $50 on October 27 and $60 on November 17, from dues received, bringing the current balance to $1,537.13.